Explore the streets of Tokyo's Shimbashi neighborhood on a 3-hour food tour where you will visit four food stops. Experience how the local salarymen (office workers) unwind after a long day at the office in the maze of Shimbashi eateries, izakayas (pubs), and standing bars. 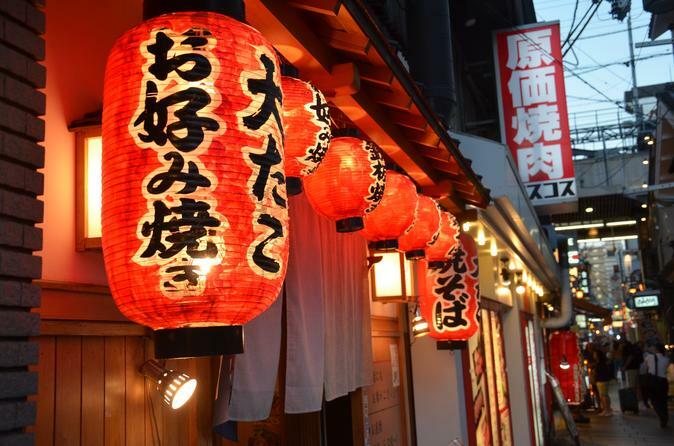 Dine with the locals and try scrumptious dishes such as okonomiyaki (Japanese-style savory pancake), gyoza nabe (dumpling hot pot), sashimi, and taiyaki (a fish-shaped cake). At 5pm, meet your guide at Shimbashi train station. Come hungry and thirsty, and ready for a 2.5-hour tour in which you will experience the endless rows, alleys, and twists and turns of Shimbashi, the 'salaryman center of the world.' Known for its rustic izakayas and abundant food stalls, discover some of the area's most tucked-away places to grab some delicious food. Begin your tour outside Shimbashi Station and enter the chasm of eateries filled on a nightly basis by the working class of Japan. You are instantly surrounded by thousands of salaryman descending upon their favorite izakaya bar to grab a quick bite and cold beer before taking the long train ride home. Not far into your journey, stop for okonomiyaki, a savory pancake made by mixing ingredients like finely sliced squid, shrimp, pork, beef, and cabbage into a batter made from flour before grilling on a flat-iron grill. Wash your okonomiyaki down with a cold drink. Continue winding your way through the maze of izakayas and long alleys filled with local eateries. Head to another spot that specializes in food from the south of Japan. This place grows their own vegetables and raises their own chickens so everything is extremely fresh. Try four different varieties of local food, each with a very distinct taste from this region of Japan. Finally, enjoy a special traditional Japanese dessert called taiyaki, a fish-shaped street dessert with a choice of filling, cream or azuki (bean paste). Take advantage of the opportunity to see how the dessert is prepared; taste one of the best taiyaki you'll find in Tokyo and discover why it is the locals' all-time favorite. Take your time at the last spot and once everyone has satisfied their appetites, end the tour back at Shimbashi Station.